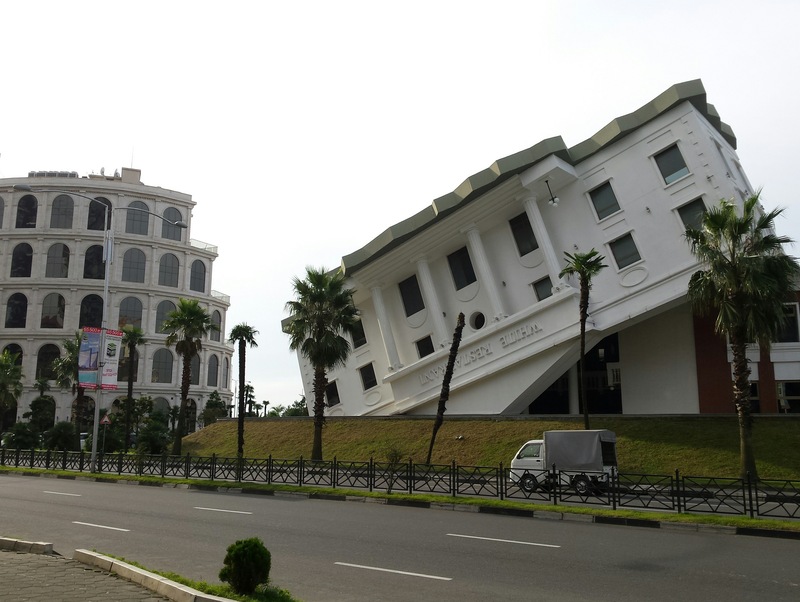 Having posted about Tbilisi, I should say that I’m now in Batumi, Georgia’s second largest city, a pleasure resort on the Black Sea. It is totally unlike Tbilisi in most ways, although it does share some of its problems with traffic congestion and pollution – whereas English has become Tbilisi’s second language, here it’s Russian (and Turkish), and the city has much less of a European feel to it. Whereas visitors to Tbilisi come mostly for culture (including food and wine! 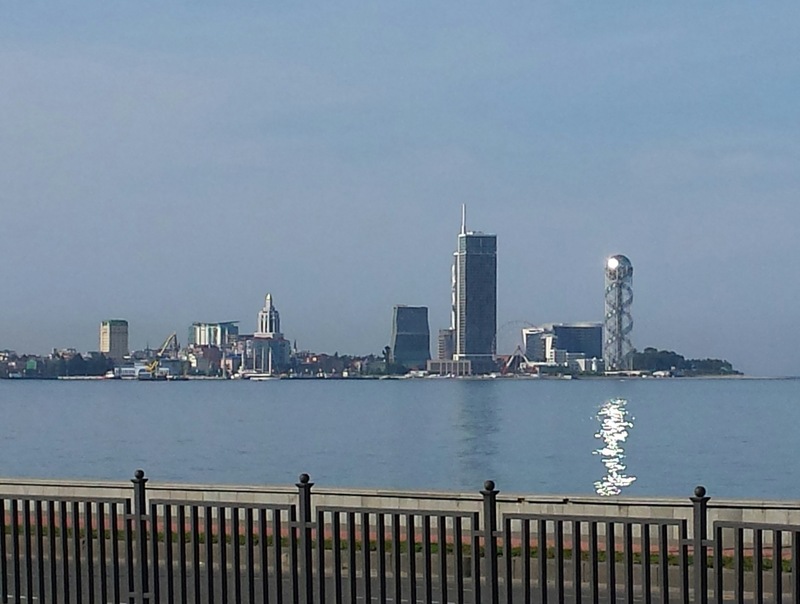 ), they come to Batumi for the casinos (not the beach, which is stoney and polluted). 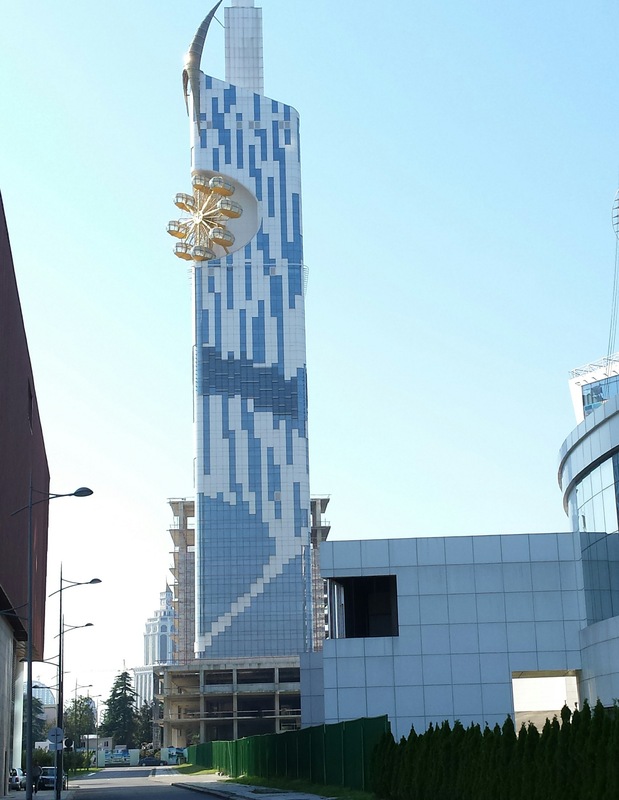 President Saakashvili (see my Tbilisi post), in his mad rush to boost the Georgian economy as fast as possible, decided that Batumi should become the Las Vegas of the Black Sea, and brought in major hotel and casino chains with massive tax breaks. 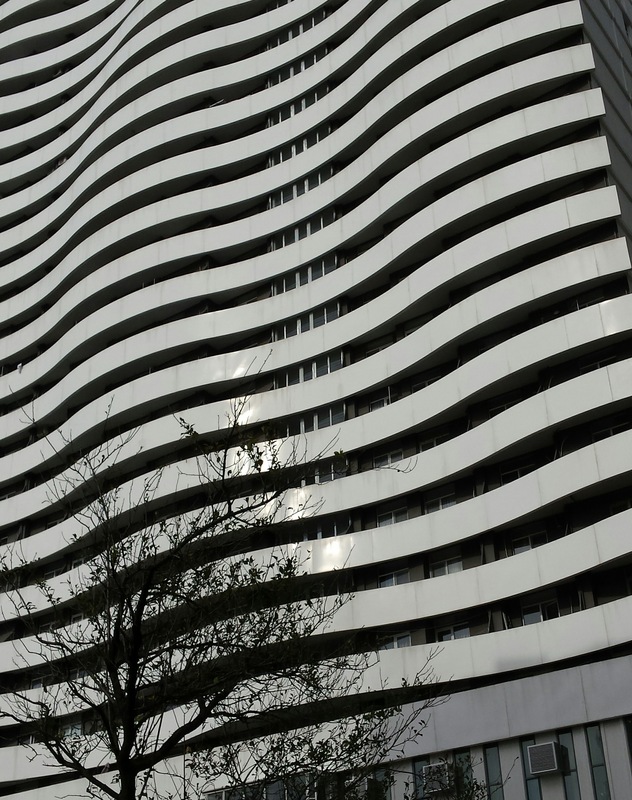 He encouraged a surreal mishmash of exuberant architecture that (like Las Vegas) is definitely worth a flying visit at least. 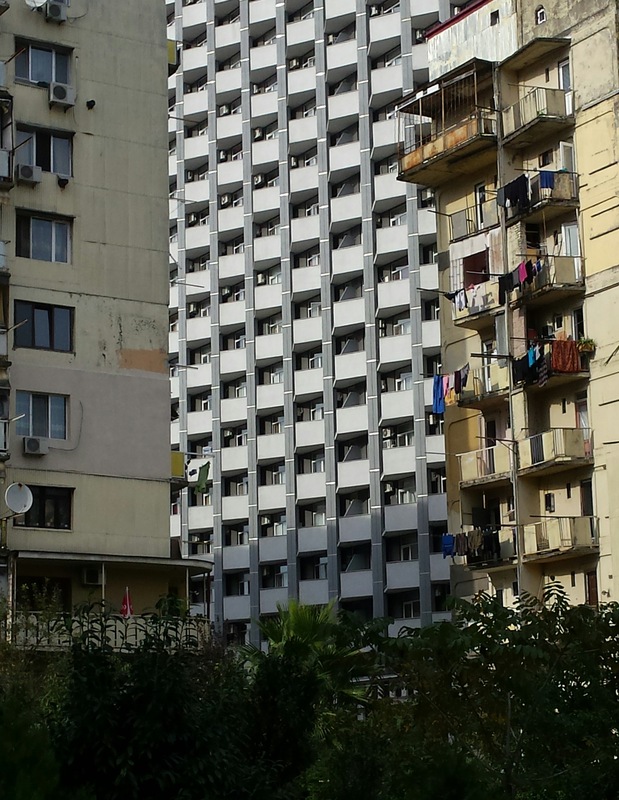 I’m not going to write a lot, but I will post some photos of these buildings below (loosely, from north to south). 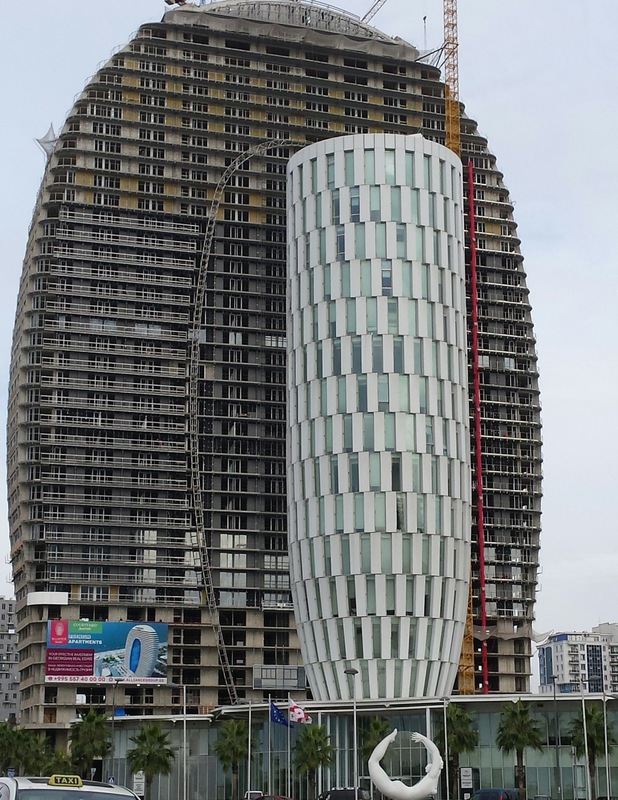 While the over-the-top kitschy exuberance of Batumi’s new buildings still thrills, or at least provokes giggles, I do sense that the project has gone ever so slightly off the boil since Saakashvili left office (and the country – he moved to Ukraine to become governor of Odessa, but then fell out with the political establishment there and is currently stateless). The Chinese pagoda no longer houses a Chinese restaurant, the windmill restaurant is no longer Dutch-themed, the Tower Brewery no longer brews its own beer – they all now serve fairly basic Georgian food for holidaymakers. And the Chacha Fountain no longer flows with chacha (Georgian grappa) once a week (in fact it allegedly only worked once, as in one time only). There are also hints of juicy scandal associated with Donald Trump, which I don’t think will make it into the book. 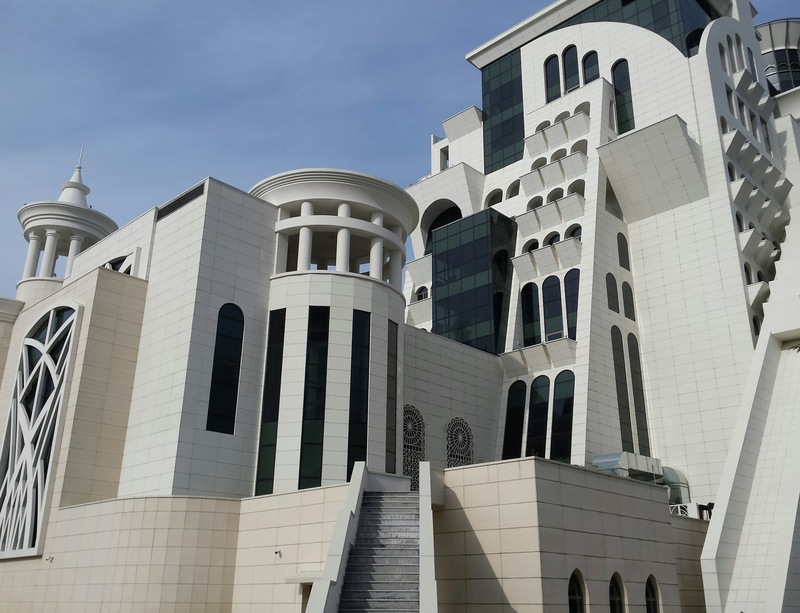 In 2012 the future US president met Georgia’s President Saakashvili in Batumi to launch a Trump Tower project here – Trump was only going to sell his name rather than actually investing in the project, but it was a typical piece of grandstanding aimed at helping Saakashvili’s UNM party in upcoming elections. However in August 2017 a long investigative article in the New Yorker by Adam Davidson suggested there might be rather more to it, as part of a murky network of money-laundering and tax avoidance. It might, or might not, play a significant rôle in Robert Mueller’s investigation into Trump’s election campaign – it would also be pretty poor PR for Georgia, even though Saakashvili is long gone from the country. The Georgian developer, Silk Road Group, still hopes to build the tower – at one point they talked of calling it T Tower, so that Trump’s name could be attached after he leaves the presidency, but now it’s more likely to be called the Silk Road Tower. Donald Trump Junior’s notorious June 2016 meeting at Trump Tower in New York City, when he hoped to buy Russian dirt on Hillary Clinton, was also attended by Irakli Kaveladze, a Moscow-based Georgian businessman representing the Russian oligarch who set up the meeting. Kaveladze has been accused by congressional investigators of a scheme to launder US$1.4 billion of largely Russian money through US banks (he denies the allegations and says he attended the meeting as a translator). I don’t think there’s any connection with Georgian-born New York property developer Tamir Sapir, who built a hotel-condo block that became Trump Soho after The Donald bought an 18% share of the project in 2005. I remember walking past the site for the Trump Tower in Punta del Este, Uruguay, as well, but it seems that one really is being built and will be finished in 2018. As for practical news, I’ll just say that trains are becoming a better and better alternative to marshrutka minibuses, especially for the Tbilisi-Batumi journey – you can take a sleeper, or a fast day train operated by double-deck electric-multiple-units (which were ordered from the Swiss company Stadler for Moscow’s airport express, but when the rouble lost value they couldn’t afford the whole fleet, and Georgia and Azerbaijan got together to make an offer that Stadler couldn’t refuse). Personally I don’t think marshrutka drivers are actually suicidal, but after four weeks travelling around Georgia I’m finding the marshrutka experience (the death-defying overtaking, in particular, as well as all the waiting around) just a bit wearying, and so I thoroughly recommend train travel instead. 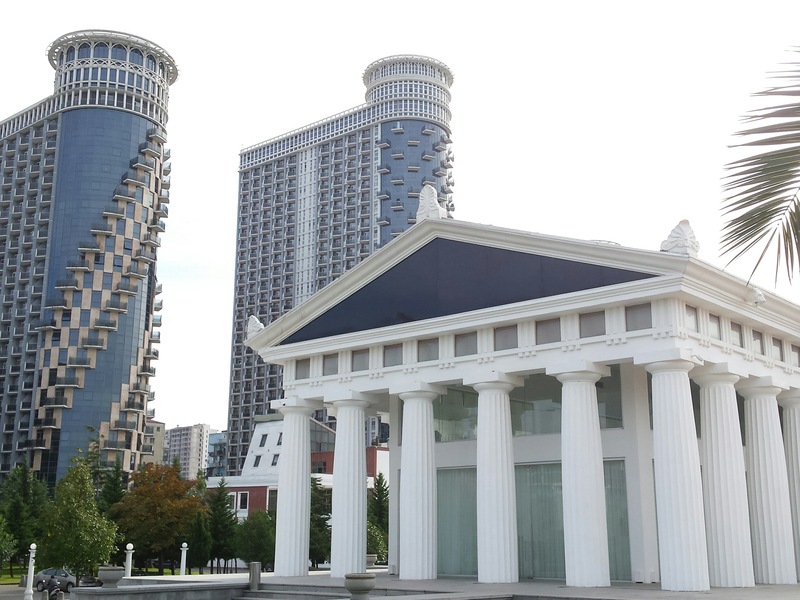 A new station called Batumi Central opened out of the blue just as we were going to print with the last edition – we couldn’t cover it properly because the book would have needed re-indexing, but it got mentioned. It’s not at all central, being at least 2km north of town, but is still more convenient than the previous terminus at Makhindjauri (and it’s served by the same buses, which is handy). People often ask why the trains don’t call at Kutaisi, Georgia’s third city, which is just off the main line, and I suggest getting off at the small station of Rioni, just south of the city, where taxis await. In fact by the summer of 2018 there will be a new 2-kilometre loop to a station at Kutaisi Airport (Georgia’s booming low-cost hub), where all trains will apparently stop. This isn’t so close to Kutaisi itself, but coming from Batumi it will be a handy place to change to a bus or taxi into the city. 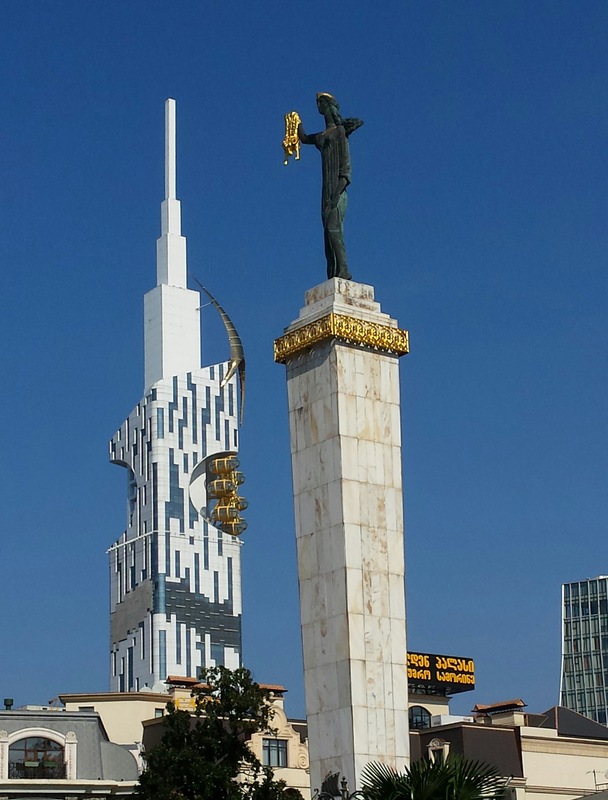 Batumi from the north (near Batumi Central station), with the Alphabetic Tower to the right. This was built to house a Technical University – with a Ferris Wheel in the façade, for some reason. The Technical University building, with a statue of well-known child-murderer Medea. 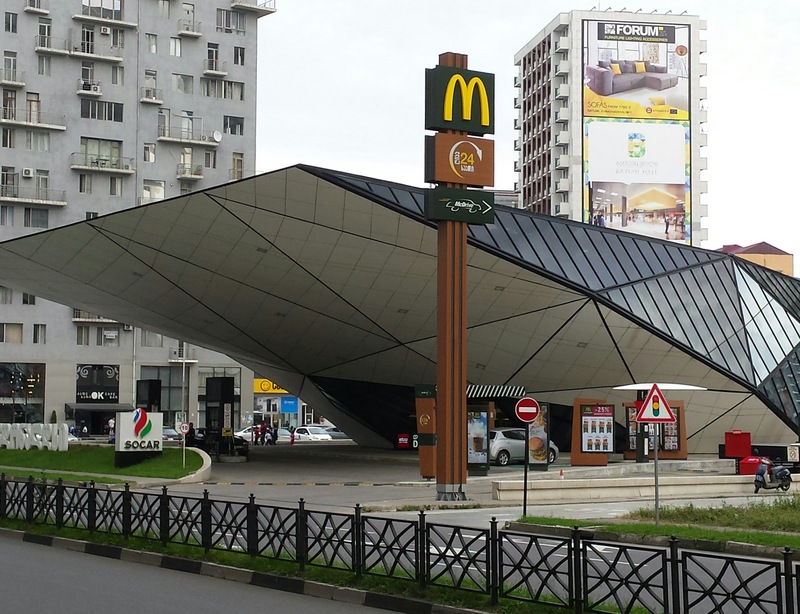 Batumi’s award-winning on one side a petrol station, on the other a McDonalds building. The Public Service Hall dwarfed by the Alliance Tower, floors 1 to 6 of which will house a Marriott Courtyard hotel. The Parthenon – a restaurant, of course. The Colosseum and the Upside-Down restaurant.